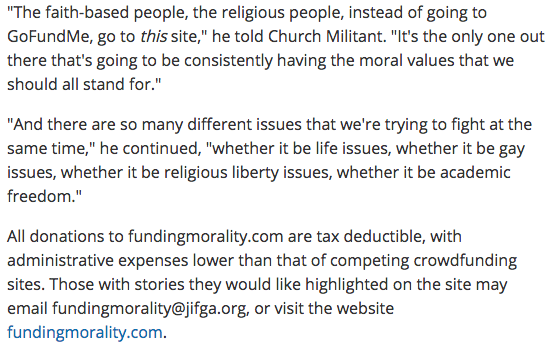 Below are two screenshots from the Church Militant post, New Crowdfunding Site Supports Moral Causes. When one starts from the premise that the solution to the problems of the Novus Ordo church is Opus (ju)Dei then it is only logical that one would end up supporting an organization such as JIFGA touting the Noahide Laws as Biblical! Yes, Opus (ju)Dei is Michael’s answer! 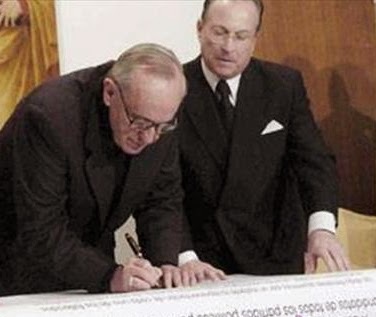 What did Francis’ late rabbinical buddy Angel Kreiman have to say of Opus (ju)Dei? Kreiman further said that Christians and Jews need to “work together in favor of the principal humanitarian causes: social order, unemployment and poverty, drugs, hunger, and the fight against a consumerism empty of spirituality.” Sounds just like what Church Militant and Francis are selling doesn’t it? 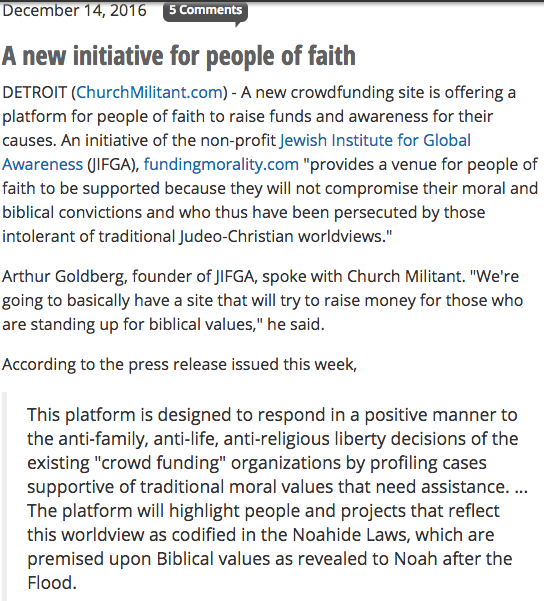 Sadly this isn’t the first time Mike and his Church Militant crew have promoted the Noahide Laws on their website. 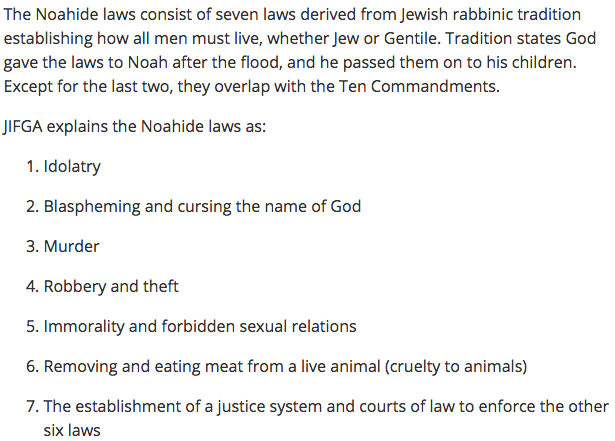 For more information see, Church Militant’s New Organization Seeks to Promote Moral Law, which also contains the seven noahide laws as shown in the below screenshot. We can hear you asking what’s so bad about the Noahide Laws? Two rabbis laying down the noahide laws for gentiles. 2. A person transgresses only when he worships the idol in the normal manner ascribed to each respective idol. Conse­quently, courts of law have to know the appropriate service for the idol in any case of idolatry. 3. 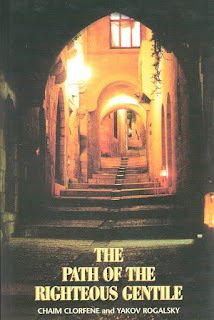 The preceding law applies to unique forms of worship. If, however, the person bows down or offers sacrifices or incense or a libation (the four forms of service of the Holy Temple in Jerusalem) to any one of the idols, he incurs the death penalty even though this may not be the way of official worship. 5. If a prophet prophesies in the name of an idol ‑ if he says for instance, “This particular idol or this particular star said to me that it is an obligation to do such‑and‑such or not to do such‑and‑such,” ‑ even if his words teach the law correctly, he is subject to the death penalty for idolatry. Worshiping an idol gets one the death penalty! Halachically, Maimonides says in three distinct places that the Christians are idol worshipers. 2. In the uncensored version of Hayad Hachazaka (Hilchot Avoda Zara 9:4), Maimonides issues the edict: “The Christians are idol worshipers and Sunday is their religious holiday, therefore in Eretz Israel we may not trade with them on Thursday and Friday of every week, and needless to say on Sunday, which is forbidden [for trade with Christians] everywhere.” Trade in this context refers especially to paying back loans, which would enhance their joy on the day of their idol. 3. Also in Hayad Hachazaka, the laws of forbidden foods, the uncensored version (Hilchot Maachalot Asurot 11:7): “The Christians are idol worshippers and their regular wine if forbidden to be consumed” by Jews since it is likely to be used as libation in their pagan service. That doesn't mean that Opus Dei is noaquid. 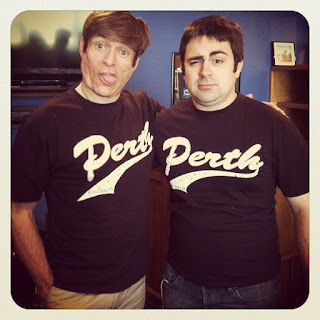 Voris pushing noahide heresy is very sad, but not that suprising. The judaic infiltration of Holy Mother Church is so vast, and tragic and is the cause of much of the considerable evil we see today, in the sense that the Church is the only bulwark against the Synagogue of Satan. Nearly everything to do with the Synagogue of Satan is lies and deception. The "Noahide Laws" have nothing to do with Noah or the revealed Word of God in the Old Testement. The Talmudists hate Noah, and Isaiah, and many other holy prophets. The very problem to Opus Dei is because they recognize Francis as the Pope. They apply true logic (recognize and follow the Pope) to wrong person. The way to avoid the Jewish infiltration of the church is to attend a chapel with a valid Catholic priest/bishop & assist and preserve the pre-1951 traditions. That means fasting after midnight for holy communion,pre-1951 Holy Week (Sat morning easter vigil) and the 1945 Holy Missal. These are the oldest traditions of the church and were the first to be destroyed and nullified. Do not be deceived,the infiltrators destroyed the 1950's apostolic traditions so Catholics would be deprived of sanctifying grace! Who did Bergoglio celebrate Christmas with? Who met with Francis on Wednesday?